If you are planning to build your home on a lot that is not connected to the town's sewage system, then you will need to install an on-site wastewater treatment and effluent disposal system. It's best to start by talking with council about your plans. Then you will need to prepare a development application (DA) that must include a water cycle management study. These are best prepared by a specialist consultant who can advise on the best type of system for your lot and for you. Read more about choosing a consultant in the document below. As part of their assessment of your DA, council must determine whether your development will have a neutral or beneficial effect on water quality. If it does, then your development has passed the water quality test part of the assessment. See the figure below that shows the process for building a home with an on-site wastewater management system. This process map only shows the assessment of those aspects relating to impacts on water quality e.g. stormwater, wastewater, erosion and sediment control, etc. 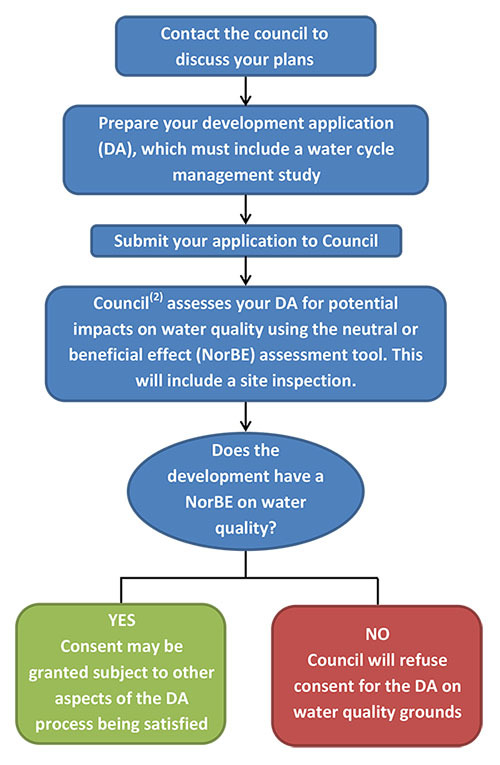 Councils are able to undertake these NorBE assessments for only certain kinds of development; otherwise the application will be sent to WaterNSW.